↑ 1.0 1.1 H K Manmohan Siṅgh. "The Punjab". The Encyclopedia of Sikhism, Editor-in-Chief Harbans Singh. Punjabi University, Patiala. Archived from the original on 5 March 2016. Retrieved 18 August 2015. ↑ Latif, Syad Muhammad (1891). History of the Panjáb from the Remotest Antiquity to the Present Time. Calcultta Central Press Company. p. 1. The Panjáb, the Pentapotamia of the Greek historians, the north-western region of the empire of Hindostán, derives its name from two Persian words, panj (five), an áb (water, having reference to the five rivers which confer on the country its distinguishing features." ↑ Changes in the Socio-economic Structures in Rural North-West Pakistan By Mohammad Asif Khan  Archived 14 April 2016 at the Wayback Machine. 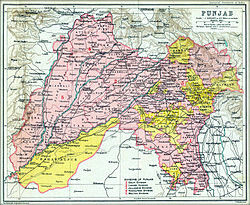 Peshawar was separated from Punjab Province in 1901. ↑ Nadiem, Ihsan H. (2007). Peshawar: heritage, history, monuments. Sang-e-Meel Publications. Archived from the original on 16 October 2015. Retrieved 13 September 2015. ↑ "Jammu and Kashmir". Encyclopædia Britannica. Archived from the original on 10 March 2016. ↑ "Epilogue, Vol 4, Issue 11". Archived from the original on 4 February 2016. ↑ Pritam Singh Gill (1978). History of Sikh nation: foundation, assassination, resurrection. University of Michigan. : New Academic Pub. Co. p. 380. ↑ G. S. Gosal. "Physical Geography of the Punjab" (PDF). University of California, Santa Barbara. Archived (PDF) from the original on 8 June 2012. Retrieved 3 November 2012. ↑ Grewal, J S (2004). 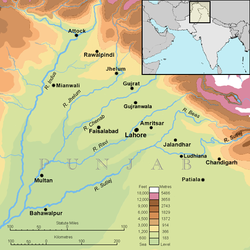 Historical Geography of the Punjab (PDF). Punjab Research Group, Volume 11, No 1. Journal of Punjab Studies. pp. 4, 7, 11. Archived (PDF) from the original on 3 December 2012. ↑ Balder Raj Nayat (1966). Minority Politics in the Punjab. Archived from the original on 5 February 2016. Retrieved 13 September 2015.